Streeterville is a neighborhood in the Near North Side community area of Chicago, Illinois, United States, north of the Chicago River in Cook County. It is bounded by the river on the south, the Magnificent Mile portion of Michigan Avenue on the west, and Lake Michigan on the north and east, according to most sources, although the City of Chicago only recognizes a small portion of this region as Streeterville. Thus, it can be described as the Magnificent Mile plus all land east of it. The majority of the land in this neighborhood is reclaimed sandbar. 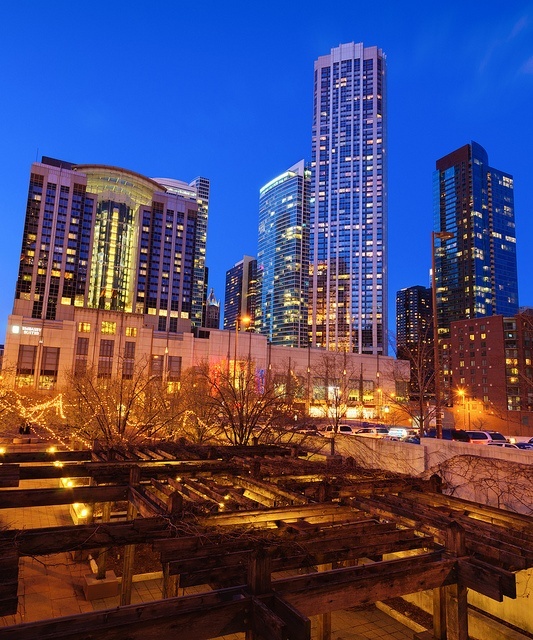 Although there is general agreement that Streeterville is bounded on the west by the Magnificent Mile, the City of Chicago and the Streeterville Organization of Active Residents, claim the boundary extends one block further to the west to Rush Street. Streeterville includes some of Chicago's tallest skyscrapers, such as the John Hancock Tower, and upscale stores, hotels, and restaurants. Although its main campus is in Evanston, Illinois, Northwestern University has its Chicago campus here. Northwestern Memorial Hospital and its Feinberg School of Medicine is located in Streeterville. The Prentice Women's Hospital opened in October 2007, and construction started on the new campus of the Ann & Robert H. Lurie Children's Hospital of Chicago in April 2008. The Northwestern University School of Continuing Studies and part of its Kellogg School of Management are nearby. The Northwestern University School of Law is at Chicago Avenue and Lake Shore Drive, adjacent to Lake Shore Park and Lake Michigan. Next to the Park is the Museum of Contemporary Art, Chicago. The downtown campus of the University of Chicago Booth School of Business has a Chicago River setting to the south. The east side of the Magnificent Mile portion of Michigan Avenue is part of Streeterville, as are Navy Pier, the most visited attraction in Chicago, and the John Hancock Observatory, the eighth-most visited attraction in Chicago.